Dropping smartphone prices, have driven the massive increase in the usage of mobile phones across UAE. The large scale rise in adoption of social media can be attributed to the easy availability of super-fast internet at very low prices. The explosion in YouTube usage is due to the increased prevalence of fast internet connectivity. Whatsapp’s willingness to keep reinventing its product and keep offering novel experiences to its customers is the reason that it has surged past all other competitors and established a unique niche of its own among chat apps. According to the latest statistics, a whopping 99.26% of the UAE population remain active on social media. This means that in 2018, an eyeball popping 9.38 million people come online on social media almost every day out of a population of 9.45 million people. In 2018, UAE saw a 6% annual growth in mobile social users. The usage of social media recorded a 2% increase from the previous year. Mobile social media usage has been booming in the country. 8.7 million users access social media through their mobiles devices. That is 92.6% of the population of the country. The 2018 usage statistics show that the number of mobile social media users in the country recorded a 6% growth with more than 500,000 new users added last year. Falling smartphone costs and easy availability of cutting edge technology are the major reasons for this boom. Facebook remains the most popular social media platform, but the 2018 social media usage statistics indicate that it is closely followed by the fast-growing YouTube community. Almost 83% of the UAE’s population have profiles on Facebook while YouTube’s penetration stands at 79%. Facebook has found favor among the commercial entities, political class as well as the masses of the country. The latest statistics for 2018 show that, with 7.75 million users, Facebook is poised to remain a potent force for many years to come. Several popular brands use their Facebook profiles to reach out to fans and provide them unique offers and messages. YouTube, second on the list with 7.47 million users, faces stiff competition from Instagram. A very large percentage of Instagram’s 5.01 million users are young people, especially teenagers. 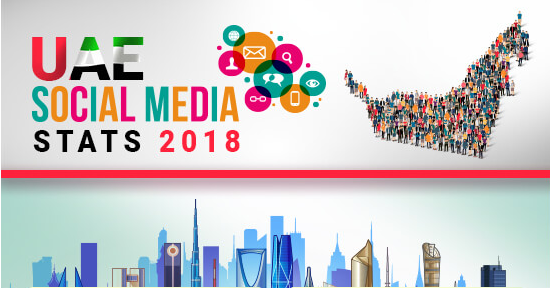 A few other social media platforms that are popular in the UAE are Twitter (41% penetration), LinkedIn (40% penetration), Google+ (38% penetration), and Pinterest (22% penetration). Predictably WhatsApp is the most popular chat app in the UAE. WhatsApp has 7.84 million users in the UAE, which is 83% of the country’s total population. 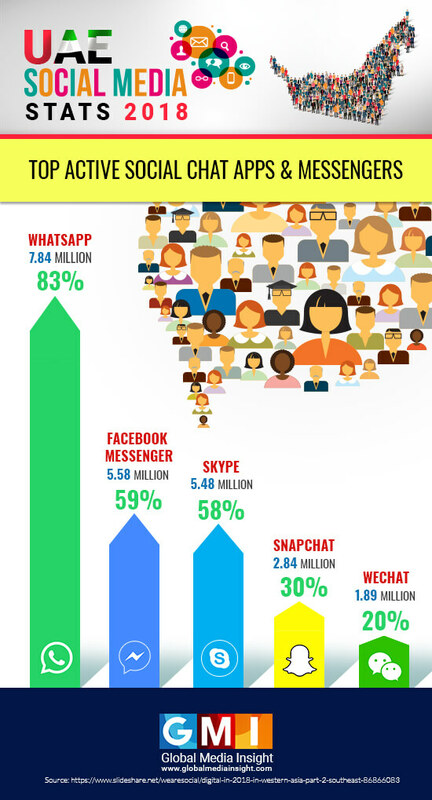 FB Messenger, with 5.58 million users and 59% penetration among the UAE population, is second. Despite frequent disruptions in service, Skype remains third in popularity with 5.48 million users, while Snapchat, which is really popular among teenagers, has 2.86 million users. Fifth in the list of 2018 social media chat apps is WeChat with 1.89 million users. From being a force for connecting people, social media has now evolved into a major advertising medium for brands to connect with their customers. Social groups play a massive role in connecting people with similar interests and they can also serve to motivate people to improve themselves. Facebook communities are also playing increasing roles in ever-transforming global geopolitics. If you are looking for an entry into the world of social media or that perfect boost to your social media campaign, then Global Media Insight is the perfect choice for you. Our 17 years of experience in the digital field has given us unmatched expertise in social media and what makes it tick. Our social experts are adept at curating the perfect message for your brand that can resonate with exactly the kind of audience that you are looking to reach. Get in touch with us today for a tailor-made social strategy that is perfect for you. This article was update on May 4th 2018.